So lately I've been feeling really blue, electric blue to be precise! Often I wear a lot of black and I will admit there is the odd occasion where my outfit consists entirely of black, black dress, black tights, black boots, even black underwear (!) but what I've realised is the need break it up by simply adding a splash or colour or something sparkly. Last year, I was having a look in Accessorize and happen to stumble across this lovely bag in the sale. How could you not love this colour? Once I had bought it, I put it away and got it out every now and then, it was only until recently that I realised it goes with everything. Moving aside from the colour, the size of it it brilliant, not too big but big enough to take to work with your essentials in it. Not forgetting it was in the sale at a bargain price. 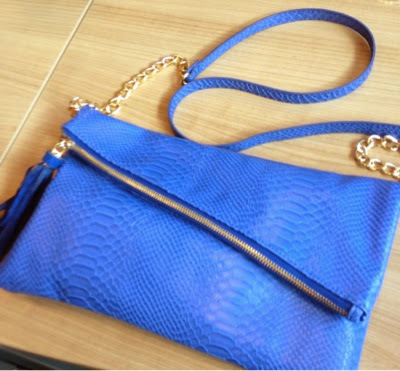 It's incredibly diverse, you can remove the shoulder strap so it transforms into a clutch, which means you can literally take it from a day time to evening effortlessly. 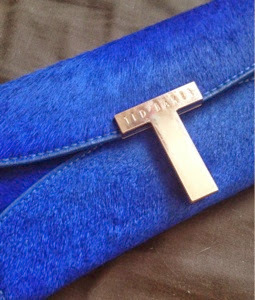 This is another fave of mine, my Ted Baker purse. I will forever be a lover of black clothing but having a simple statement bag or piece of jewellery can really add a positive twist on a rather melancholy outfit!